The Community Health Outreach food pantry has two locations in Jacksonville. Clients are allowed a maximum of 12 visits per year and may not receive food more than once in a seven day period. This information is tracked utilizing an excel spreadsheet on Sharepoint. This format is challenging for many of the volunteers who are elderly and often the data is altered unknowingly. Students developed a Web application system that can be accessed from multiple locations, and track client information and dates of visit. Volunteer users were provided read-only status to view client information and make only required data entries thereby minimizing client data corruption. Admin users were provided ability to manage client information and generate pre-built reports. The system is password protected and accessible via the web. Displays uneditable by the general information for volunteers, but editable information for administrators. Ability to run reports on client data and food pantry allotted. The Way Free Medical Clinic wants to manage volunteer data in an electronic system which would allow all paperwork and data to be permanently stored in a paperless system. The problem faced by the clinic was keeping track of volunteer time which was being documented using paper time sheets. Every week, clinic staffs would spend considerable amount of time entering the information from the sign in sheet to excel and generate reports required by sponsors. Students developed a web-based system to manage volunteer demographic information and ability for volunteers to time in and out when they work at the clinic. Admin were provided functionality to manage volunteer information, resolve conflict time entries, and generate reports required by funders. The goal of this project is to develop a Food Services Inventory System that can track, adjust and be accessed from any computer, tablet or smart phone. City Rescue Mission (CRM) used less-than-optimal solutions to manage warehouse inventory. All product-stock was recorded in a simple spreadsheet which led to erroneous data and inefficient record-keeping. Additionally, orders placed from kitchen managers to the warehouse were done so via email. This led to islands of information with no central database in place. Students developed a web-based system to allow kitchen managers instant access inventory at any time and place orders. System provides functionality for manual entry of inventory received and manage inventory catalogue. Community Partner: ACE-Agency for Community Empowerment Inc.
Agency for Community Empowerment wants a Web-based system that will allow us to manage volunteers, events, donors and wish lists. ACE is growing rapidly, thus, having difficulty in keeping track of volunteer and employee hours, as well as qualifications. ACE wants a system that allows volunteers and donors to log in and maintain their profile information and allow admins to maintain list of events and wish list of resources (like classroom supplies and rental pick-up truck) in-need. Students developed a web-based database and management system that will allow volunteers to register and create an account. System allows administrator to read and approve new volunteers and keep track of their qualifications. Systems allows creates reports relevant for funding agencies. School of Computing wants to replace the current paper-based approach with all-in-one scheduling tool that will eliminate the need for hours upon hours of planning by hand. Unischeduler should be one-stop solution for departmental scheduling of classes from semester to semester that will handle filling out the standardized scheduling Excel spreadsheet electronically. Students developed a web system that allows instructors to submit their course preferences form electronically and have the ability to update their form constantly until the due date. Based on inputs received from instructor and rules provided by the admin, system dynamically creates a draft schedule. Produces draft schedules using faculty schedule data using an intuitive GUI. The GUI displays all department courses in a user-friendly fashion allows easy changes to be made by simply clicking and dragging. Produces an Excel Spreadsheet when the schedule is finalized for sending to the college scheduler. The Thomas G. Carpenter Library (“library”) needs a web-based study room reservation system that can be used to manage 21+ different group study rooms within the library. The system is to be utilized by students and faculty alike, and it should be both mobile and desktop ready. The System should adhere to library group study policies and procedures, and it should be capable of running on a LAMP hosting platform that the library will provide. Students developed a web system that displays room details, pictures, and a “floor plan” view of where the room is located. The system provides several views, including a public view that allows people both on campus and off campus to make reservations, an administration view that allows library staff to manage the rooms and make adjustments to existing reservations, and a tablet-ready view that shows individual rooms—this view will be displayed on mounted iPads just outside each door. These views provides both the daily schedule for that particular room as well as allow someone to book an open slot. Students developed an attractive home page with a carousel displaying the currently available study rooms and library instructions for reserving a room. The second tab includes . The third tab entitled “Check a Reservation” allows students to verify if the second party involved has confirmed the reservation. Students have many ways of viewing, scheduling, and reserving a study room. Groundworks JAX wanted a volunteer management system (VMS) that allows us to manage volunteer information, event information, and events supported by volunteers. They would like to keep track of event participation and to calculate hours worked by our volunteers. Students developed a web system that allows volunteers to create their own profile page. Admin can manage demographic information of our volunteers gathered through volunteer profile page. System also displays a summarized view of events participated and totals hours contributed by volunteers. 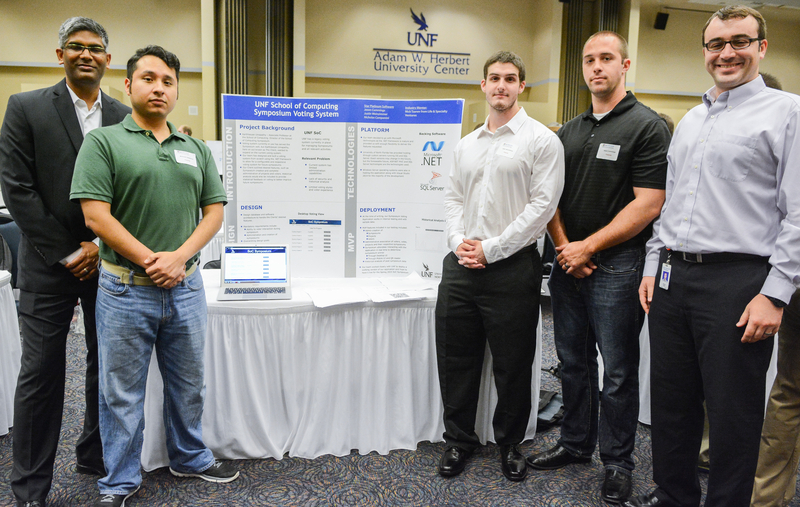 Attendees of the UNF School of Computing Symposium event can cast their vote on projects they liked. Based on the number of votes received, winners of the symposium are announced. Voting is used for deciding winners for variety of categories. Current voting system allows attendees to cast one vote per poster. Symposium organizers wanted an innovative and configurable electronic voting system. Students based a web voting system that allows switching on and off feature sets that modifies number of votes casted per poster.The system allows the symposium administrator to create and manage each semesters symposium and the corresponding projects and attendees. It allows for flexible voting styles and real time voting data during the live event. System uses a responsive web pages to allow attendees cast their vote through a mobile device via a QR code reader, or through more conventional means via a desktop website GUI. The system archives votes received every semester and generates simple reports on voting data gathered.